Le·gal In·sur·rec·tion: When Will The Europeans Apologize To Us? Two World Wars which resulted in the deaths of hundreds of thousands of Americans, who had to liberate Europe from itself. Colonialism in the Middle East which resulted in absurd and artificially drawn state borders, leading to generations of ethnic/religious conflicts which we had have to deal with in places such as Iraq, Syria, Jordan and Israel. Colonialism in Africa which resulted in absurd and artificially drawn state borders, leading to generations of ethnic/tribal conflicts which we have had to deal with throughout Saharan and sub-Saharan Africa. Colonialism in Southwest Asia which resulted in absurd and artificially drawn borders, leading to generations of ethnic and religious conflicts which we have had to deal with in places such as Pakistan and Afghanistan. Colonialism in Southeast Asia, which we have had to deal with in places such as Vietnam. Refusal to defend themselves from communist aggression (with a small number of exceptions) putting the burden on us to station tens of thousands of troops in Europe for several decades, at a cost in the hundreds of billions of dollars. Undermining our position in the world at every opportunity (France) just for sport. And we could go on and on. The history of the last 100 years is the history of the United States having to clean up Europe's mess and to deal with Europe's ego. So if there are to be apologies, they should travel from East to West, not the other way around. 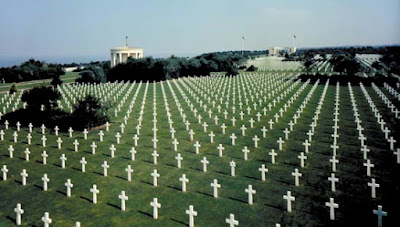 Question: How many Europeans have died defending us? It turns out (from personal experience and the personal experiences of people close to me) that if you go out into the European countryside and talk to the real people, they will often (upon finding out that you are an American) take you to0 the local cemetery -- always well kept --where Americans are buried, and will tell you what they know, with obvious gratitude. This was true in France even when the "Official" relationship was pretty estranged. And I believe, as a matter of fact and record, that a lot of Europeans died protecting Americans. And lastly, I suppose it is rude and noe-PC to ask, but does the name Lafayette mean anything to you? I'll give you Lafayette, but not de Gaulle. Another good perspective by Mr. Jacobson. Larry your moral equivalency is sorley lacking. Professor: Thanks for saying it, and saying it so well. Actually, I would say that Great Britain and Poland are the exceptions. Poland has been and, for the forseeable future, will be a very large and unapologetic ally and friend of the United States. Great Britain...well, even after the slap in the face that Obama has been giving to them since January 20th, should go without saying.